About 30 feet away from our clinic is the Magnificent Mile with its wide and often beautifully adorned sidewalks, big name stores, restaurants, art museums (e.g. Art Institute of Chicago), the Field Museum and Museum of Science/Industry, and architectural landmarks (John Hancock Center, Water Tower Place, Tribune Tower, etc). All of that and more can make it an enjoyable day trip. Our practice typically has one "out of state" patient every day. Below, we have marked favorite hotels near our clinic in bold. 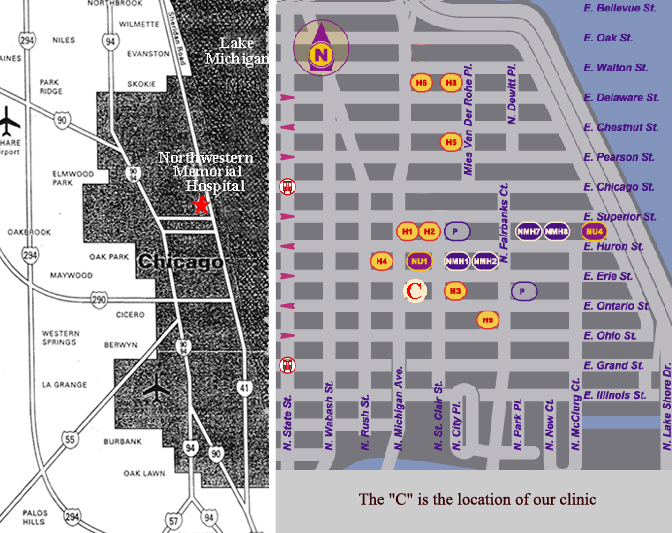 We think that staying near the clinic is the best idea as one can then explore downtown Chicago when not in the clinic. Another idea is to stay in a less central hotel close to the CTA/Metra lines. One can get downtown from O'Hare (for example) in about 1 hour on the CTA.. A Google map of the clinic area can be found here. A hotel map is below, with our location marked with a 'C'. H3: Hyatt Chicago Magnificent Mile, 633 North St. Clair Street (one block away). (expensive, ask for the NMH discount). For information about parking and transportation, go to this page.